HERE AT THE FLORIDA WEEKLY, WE pride ourselves on being the most knowledgeable kids in Key West. 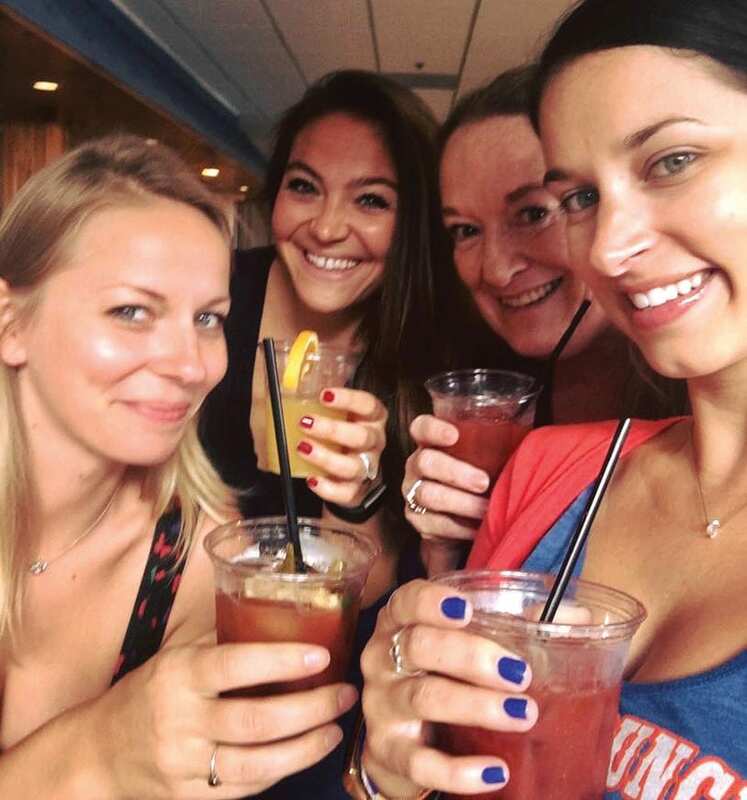 Need a comprehensive happy hour guide? We’ve got your (pickle) back. Looking for indoor activities to while away a rainy day? We’ve got museums, theaters and attractions enough for a storm of monsoon proportions. 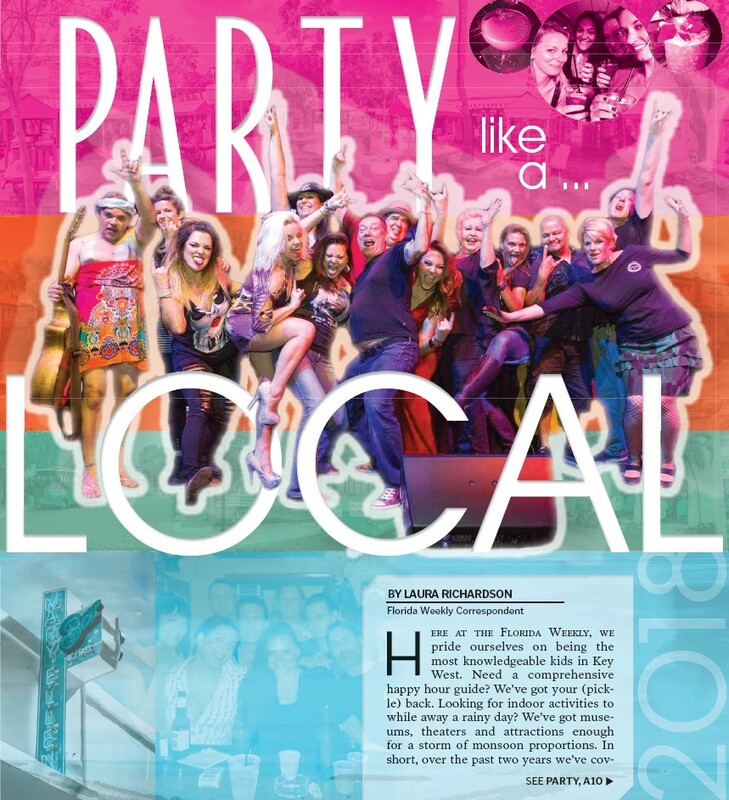 In short, over the past two years we’ve covered every square inch of this island to bring you the best spots to drink, dine and dance and, most importantly, we’ve let you in on our little locals’ secrets. And like any living organism, Key West is constantly evolving. Although many of our Party Like a Local recommendations from years past still stand — the Hindu is still the best ship in town, Virgilio’s’ Martini Mondays remain the best way to ensure you wake up Tuesday morning in a stranger’s backyard without your shoes, Little Pearl continues to serve up exciting and innovative dock-to-dish masterpieces, Mary Ellen’s is slaying the late-night chow and entertainment game, and everyone still loves Patrick and the Swayzees — a few recent additions deserve mention this time around. We get a million mixed dietary messages daily: carbs are the devil (but everything is OK in moderation so maybe don’t go setting fire to your Italian cookbook collection just yet); too much fat isn’t good for you (but the Mediterranean diet is pretty fat forward and those people live forever so bring on the butter! ); and eating sugar is practically as bad as smoking a pack of cigarettes (but dark chocolate is full of antioxidants and those fight cancer so pardon me while I dive mouth-first into a Lindt bar). The one gastronomic constant? Breakfast is the most important meal of the day. And if you’re a morning meal skeptic, the folks at The Breakfast Club, Too (610 Greene St.) will be more than happy to dispel any doubts you may have. Their monster menu brims with benedicts, breakfast sammies and “Big BC Waffles,” which are approximately the size of Andre the Giant’s gargantuan head. The röstis are like hash on steroids seasoned home fries served in a cast-iron skillet and topped with anything from brie and apples to corned beef and cheddar and the smoothie bowls are the stuff of any yogi’s vegan dreams. Would you prefer a liquid brunch? With 12 varieties of bloody Marys, 11 types of mimosas (including their signature Mermosa made with blueberry-hued Blanc de Bleu champagne and passionfruit vodka) and nine additional specialty cocktails, we wouldn’t blame you for hitting The Breakfast Club, Too every morning of the week to perfect your breakfast/cocktail pairing. On top of all that, The Breakfast Club, Too also houses the Gratitude Island Coffee Co., an artisan espresso bar that donates a portion of its proceeds to the Key West Turtle Club, Reef Relief and the local Florida Keys SPCA. Oh, and did we mention it serves breakfast all day (until they close at 4 p.m.)? So, when you roll out of bed in a hungover haze at 1 p.m. with a huge hankering for biscuits and gravy, The Breakfast Club, Too has you covered. 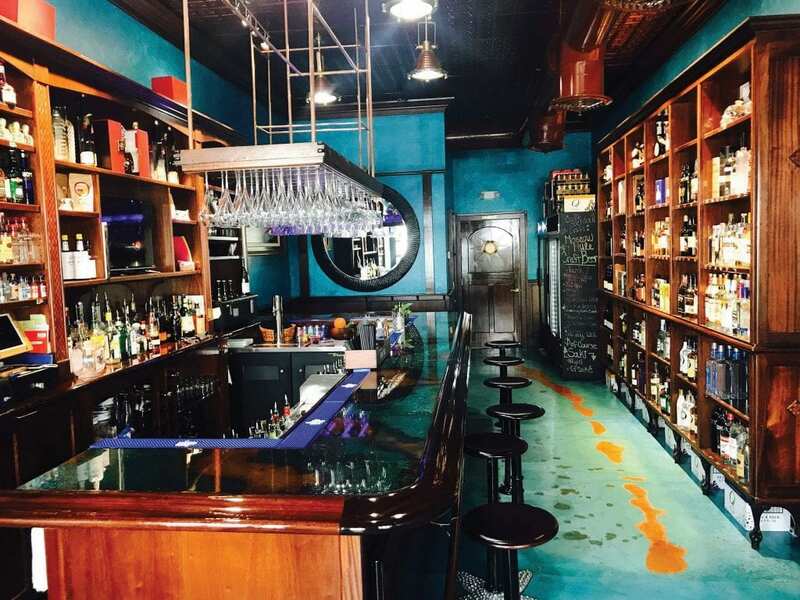 Owner Maria Renna has completely renovated the interior of the Roost. Tiki House serves exotic tropical drinks. Garrison. It would be all too easy for Jen to throw some rum in a tiki mug with some fruit juice, slap a tiny umbrella on it and call it a day. 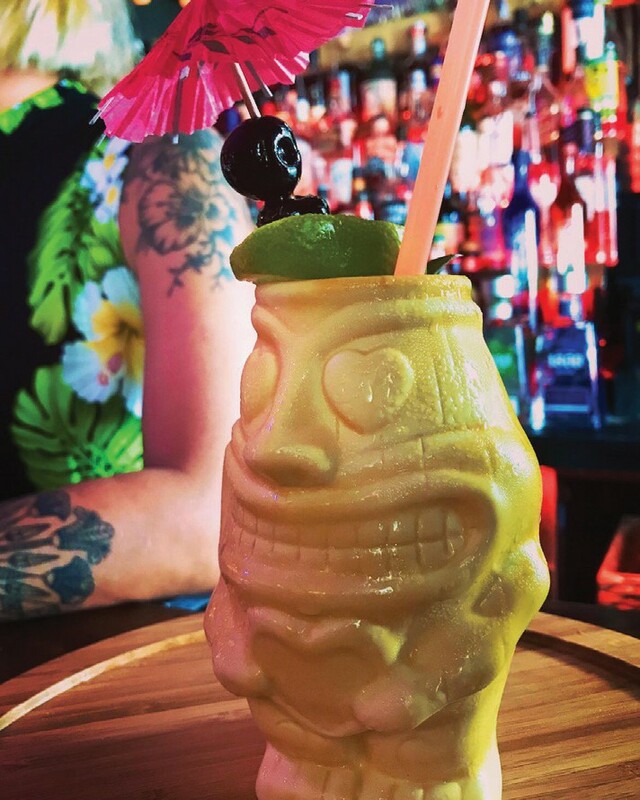 Instead, Jen delved deep into tiki history to craft classic cocktails that are true to tradition yet modern in interpretation. For example, the Mai Tai at Tiki House is a far cry from the pineapple and grenadine-laden nightmare you might find on a menu at a Trader Vic’s knock-off. Instead, Jen combines Don Q Cristal and Wray & Nephew rums, orange Curaçao, orgeat, house-made mai tai syrup and rose water to create a tropical symphony of flavor. The Singapore Sling, Hurricane, Zombie and Schuylkill Punch are all exact replicas of age-old recipes and the Daiquiri would make Hemingway weep tears of inebriated joy, while the Missionary Highfall is an innovative take on the Missionary’s Downfall, made with whiskey instead of rum. Tiki House also features live music every day, making it one of the best places to escape the heat while still enjoying Key West’s legendary music scene in a uniquely tropical setting. Left: Key West Sandwich Co. Center: A Maria-rita at the Roost. Right: Tacos at Sinz Burritos. Sinz Burritos is located at the corner of Truman and Duval streets. St.) will satisfy your champagne-and-caviar wishes – literally. The lighting is warm, the bar top shines like a new penny and the cocktails will make you feel like you should be wearing a top hat and a monocle, but there’s nothing pretentious about The Roost. It’s perennially packed with locals in shorts and flip flops looking for a quiet place to enjoy a pre-dinner drink or a nightcap away from the Duval Street crowds. The cocktail menu features classics with a twist, like The Great Cormorant, a refreshing take on the traditional champagne cocktail that mixes St. Germain, prosecco and club soda to effervescent effect. But if you really want to sound like a local, order the popular off-the-menu Maria-rita, named after bar owner Maria Sharpe. Reposado tequila, hibiscus and habanero combine for a drink that’s a little sweet, a little spicy and a lot delicious. And from 3 to 6 p.m., caviar is half price. Yes, you read that right. Only in Key West can you snack on caviar in swim trunks and not look an inch out of place. All that drinking is bound to make you crave a little nosh sooner or later. 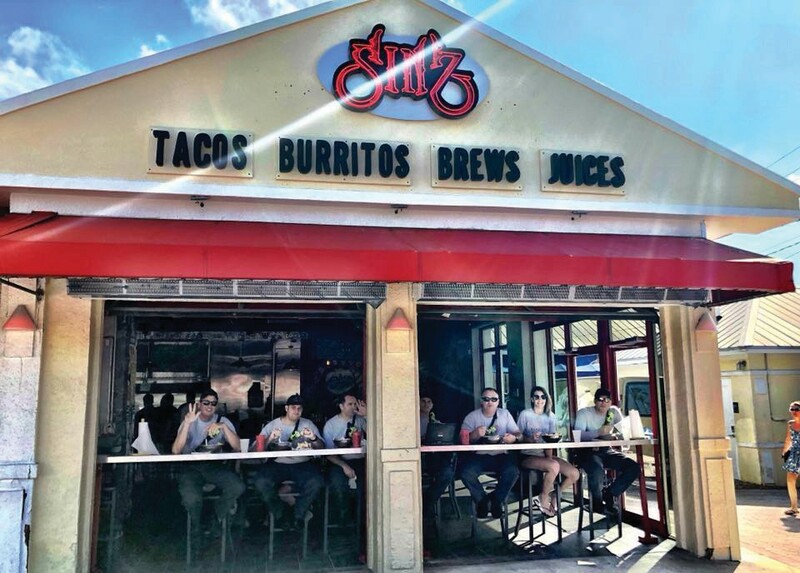 Lucky for you, two of Key West’s most exciting new culinary openings are within a stone’s throw of one another- Key West Sandwich Co. and Sinz Burritos & Brews are both located at the intersection of Truman and Duval and locals are flocking to both restaurants in droves. Key West Sandwich Co. is the Key West equivalent of the neighborhood deli where your daddy perfected his sandwich construction skills when he was in high school. Choose your bread, spread, meat, cheese and veggies and let the sandwich masters behind the counter work their magic. Feeling indecisive? You can’t go wrong with the Killer Cuban (with mojo roasted pork), the Kimchi Reuben (with house-made kimchi) or the Cheesy Beef (think Arby’s Beef ‘n Cheddar if it was designed by the Earl of Sandwich himself). Want something a little more exotic? A Mexican inspired choose-your-own-adventure awaits you next door at Sinz Burritos, where you can get your fill in taco, burrito, tostada or bowl form. If my rudimentary math is correct, there are 1,680 unique combinations of ingredients at Sinz, and that’s before you consider any of the add-ons, like the radishes and red onions pickled in house. Everything at Sinz is fresh and made in house and you can’t go wrong with a single thing on the menu, no matter which of the thousands of permutations you choose. (But make sure you get the cilantro cream on whatever what you order. Trust us.) The only problem you’ll have will be deciding whether to go left or right once you get to the Sinz/Key West Sandwich Co. complex, but if the hardest part of your visit to Key West is deciding whether to stuff a burrito or a sandwich into your face hole, we don’t feel bad for you at all.